It's a whole new year, and that means it's the perfect time to set up that website you've been thinking about – but where do you start? Well a good place to begin is with a web hosting package, and we have a brilliant deal for just that. So what's the deal? Well, you can get web hosting including a free domain for just £1 a month with 1&1 IONOS(excluding VAT). That's a ridiculously cheap price, and means you'll spend just £12 for the entire year. If you're located in the US then don't worry, you can also get your hands on this deal for just $1 a month! With this package you're getting 100GB of storage, a free domain and enough power to handle around 100 visitors every minute. Not to mention all of the plans offer secure SSL certificates, so you know your domain is safe. Sound like a deal you'd be interested in? 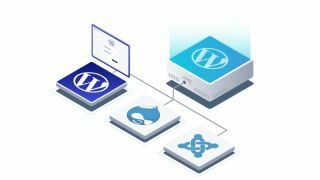 Well you can see all of the details of this deal below, or if you're not sure this is the deal for you, check out our best web hosting services page for all of the options available. This is an incredibly cheap deal. For less than the price of a coffee every month you can get a free domain, access to web hosting software and 100GB of storage. This package is perfect if you plan to host just one website and will hold up with quite high traffic rates. 1&1 holds the number 2 spot in our best web hosting guide so we highly recommend it – and it's available in the US too.